The first post for the year is about my first finished object for 2012. It also happens to be Matt’s first pair of hand knitted socks and the first Nancy Bush sock pattern that I’ve finished. So far in my knitting career my Mum, Dad, sister have all received socks made by my hands. Although Matt didn’t let on, I suspected that he was feeling a bit left out. These socks were part of his birthday present for this year, and I think they were a success. There was a bit of trial and error involved in making these socks. Initially I cast on the Yarrow Rib Socks from Knitting Vintage Socks using 2.75mm dpns because that was the size I had and the swatch was to gauge. The fabric was looking a bit loose, so I had some concerns that they wouldn’t wear that well. After seeking advice from Twitter and SnB, they were frogged and I started again using smaller needles and the Oak Ribbed Sock pattern. As it happened there was a bit of frogging going on at that SnB meet up, as a friend was frogging a pair of socks that were knit up on 2.5mm Knitpro dpns, and the resulting fabric was so firm it could have stopped bullets. Bulletproof socks were apparently not the goal, so the 2.5mm dpns were kindly leant to me. This was my first opportunity to try Knitpro/Knit Picks/whatever they’re called at the moment needles. Although there’s little risk of metal dpns breaking, I’ve been put off buying or trying Knitpro needles because of the broken circulars I’ve seen or heard about. After knitting one of the socks, I went out and bought myself a set of metal 2.5mm dpns. They feel nice and solid in my hands, have a decent point and are a good weight for me. I’m unlikely to move away from my circular needles of choice, Addi turbos, but I’d definitely consider buying more Knitpro metal dpns in the future. Tosh Sock is a great yarn to work with, and although it softened up a lot after blocking, I think it’ll wear really well. The colour way, twig, caused me a few headaches though. It’s lovely in the skein, but even fairly basic patterns kept getting lost in the mix of light and dark brown. Before making these socks, I started a Shaelyn Shawl and swatched for A Thousand Splendid Suns, but it just wasn’t working out. Even with this sock pattern there’s a bit of pooling, but I think it works well enough and Matt is happy. Before casting these socks on I bought another skein of MadTosh Sock but in Graphite. There seems to be less variegation in that colour way so hopefully finding a pattern to go with the yarn will be easier. 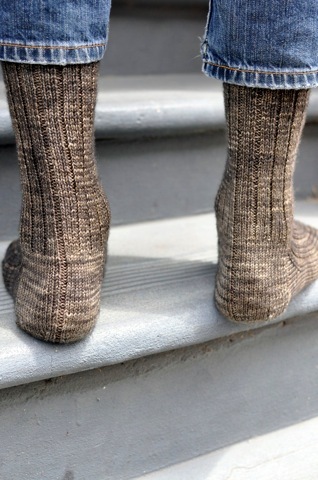 I’m very slow on the Nancy Bush sock pattern uptake, so the next paragraph or so will be nothing groundbreaking for anyone else who has used a knitting pattern by Nancy Bush. I remember borrowing Knitting Vintage Socks from the library not long after it was released and was impressed not just by the patterns, but by the sections at the front about the different kinds of heel and toe. Even though Oak Ribbed Socks are just ribbed socks, but little things like the rib ‘seam’ to the bottom of the heel, the welsh heel and the three point star toe made it a fun knit. These were meant to be finished in time for Matt’s birthday. They were finished the night of his birthday so I was kind of on time and also kind of late. Irrespective of whether they were technically on time, they’re done, he seems to like them, and I don’t think they’ll be the last pair of hand knit socks he’ll get. They’re beautiful socks. Love the colour of that yarn too. Manly and elegant. Can’t ask for anything better than that! What a lovely gift. 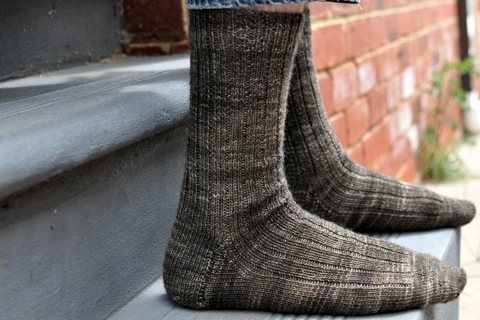 If it’s any consolation, I’ve knitted dozens of socks but none from Nancy Bush. I love Knitpicks/Knitpro interchangeables but still pefer to knit socks on dpns. However, at a craft show two years ago I saw a pair of 20cm circulars designed for sock knitting and I’m thinking I might like to try them out if I can find them at a craft show this year! Beautiful socks! And nice photography. The variegation doesn’t look too harsh in the photos, and the colours overall look really nice. I meant, the variegation doesn’t look harsh, in the light of your comments about finding a suitable pattern! a perfect combination. my favourite sock designer with my favourite sock yarn! madtosh colours are just beautiful but youre right, it can be a challenge finding the right colour for the right pattern. im a fan of the much darker colourways myself, and as youve proven here, they work a treat! and i just love those rib sock patterns in KVS. always just a little bit of variation. i use the knitpicks metal DPNs all the time, theyre my favourite sock needles, as you said, good weight and pointy! there fixed circulars are very good too, i use them for magic loop and never had any problem with the cables (that seems to mostly happen with the interchangeables). Yay! Congrats on getting them finished. You already know I think they’re gorgeous!